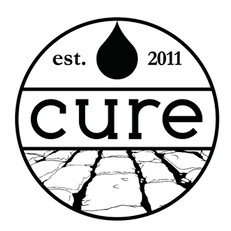 The Cure Coffeehouse, located in the Ghent District of Norfolk, VA approached our team to help brand a new product. This product is a locally brewed coffee liqueur. I took two years for Cure to curate the product, creating the perfect combination of rum and flavors to create a cold brew coffee liqueur. There are a handful of international contenders that currently own the coffee liqueur market share. The market has been rather stagnant as these big companies have been capitalizing on the market. These leading brands are: Kahlua Coffee Liqueur and Bailey’s Irish Cream. In addition to these brands there have been few attempts at locally brewed coffee liqueurs. The challenge was to name and brand the product. The name and logo had to be something that couldn’t be clearly associated with a geographical region or type of consumer. • Premium Product • Mixes well with all coffee products and tastes great on the rocks. • Can be consumed at breakfast, brunch, dinner, or dessert. • Great taste. Affluent male/female 21+. The ideal consumer is most likely educated and living comfortably. They enjoy the feeling of being artistic and creative at times, even if that is not their general personality. This consumer is always looking for the newest product and wants to be the first to try it and share with their peers. Many of these consumers have been involved with the craft beer market previously. o create the name and mark for the brand we had to take their personality into consideration, based upon a brand personality quiz. The brand is considered young and casual. People who are drawn to this brand like to try new things, simple and complex. The brand is more artistic or “Mac-like” than, say, a PC. This brand gives a sense of adventure to the consumer, which gives them an opportunity to try new things.